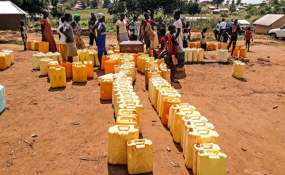 People line up at a borehole at the Kiryandongo refugee settlement camp during a water crisis that hit the region in November last year. Barcelona — Water use has been increasing worldwide by about 1 percent a year since the 1980s and researchers expect it to rise a further 20 to 30 percent from today's level by 2050. Demand has surged in developing countries and emerging economies, but water use per person in most of these countries is still far below wealthy nations. This year's U.N. World Water Development Report highlights the uneven nature of water access around the world, and urges governments not to leave behind poor and socially marginalised people in the provision of water and sanitation. * Under the Sustainable Development Goals, all countries have pledged to achieve equitable access to safe and affordable drinking water and sanitation for all by 2030, while improving water equality and ensuring a sustainable supply of freshwater. * About three out of 10 people, 2.1 billion, did not have a safely managed drinking water service at home in 2015, with only a quarter of sub-Saharan Africa covered. Of these, 844 million lacked a clean supply within a 30-minute round trip of where they lived. * About 4 billion people - nearly two-thirds of the world population - experience severe water scarcity during at least one month of the year, a number expected to go up to 5 billion by 2050. * The most water-stressed parts of the world are North Africa and the Middle East. * Access to water resources is often linked to land ownership, especially in rural areas. Women account for less than a fifth of the world's landholders, and in North Africa and Western Asia, they represent fewer than 5 percent. * Agriculture, including irrigation, livestock and aquaculture, is by far the largest water consumer, accounting for nearly 70 percent of annual water withdrawals globally. Industry, including electric power generation, is responsible for 19 percent and household use for 12 percent. * Some common products have a huge water footprint. An average cup of coffee, for instance, contains about 200 ml of water, yet the ground coffee takes 140 litres to produce. Tea, by contrast, uses a far smaller 34 litres per cup. * Rice accounts for 40 percent of irrigation worldwide and 17 percent of global groundwater depletion, with an average water footprint of 2,500 litres per kilogramme. For avocadoes, the figure is almost 2,000 litres per kg. * Cotton soaks up a lot of water, particularly when grown and produced in India, where it has a water footprint of 22,500 litres per kg, compared with about 8,100 litres if it comes from the United States. * Some 2.3 billion people, or one in every three people, did not have even a basic sanitation service in 2015, of which 892 million people still practiced open defecation. * Worldwide, more than 80 percent of all wastewater goes back into the environment without being treated. * Providing basic water, sanitation and hygiene services by 2030 would require a threefold increase in investment to an annual $114 billion. Sources: U.N. World Water Development Report 2019; WaterAid report "Beneath the Surface: The State of the World's Water 2019"